Scientists detected fast radio bursts coming from somewhere in deep space! Are they from intelligent alien life? How do scientists tell the difference between the frequencies of another galaxy, or when a star explodes, from intelligent life? The official jury is still out, trying to make heads or tails of the evidence collected. The Green Bank Telescope, in West Virginia, picked up signals that scientists call 'FRB 121102' and they originate from a Dwarf Galaxy some 3 billion light years away. It's the first recurring FRB to date! 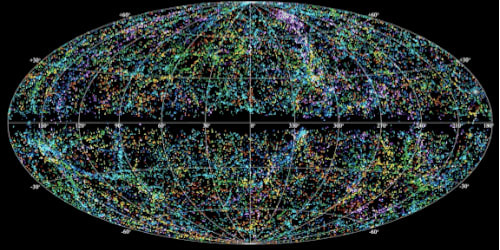 The phenomenon known as Fast Radio Bursts or FRB's, can be heard on the 4 to 8 GHz radio frequency band. These are temporary signals of only about 5 milliseconds in duration (bursts) and get picked up in seemingly random intervals. That only makes them even more frustrating for scientists to study further. Since they're usually only heard very faintly from a distance which is calculated to be hundreds of billions of lightyears away. An Astrophysicist at West Virginia University, Duncan Lorimer, was the first to discover FRB 121102, which is the only FRB known to faithfully repeat. Mr. Lorimer first heard it in 2007 and he traced it to only one location. Since this particular repetitious signal could be traced to its original location, deep in space, this made it particularly easy for his team to identify again. Which they did after hours and hours of waiting. The archived data from the Parks Radio Telescope documents the first heard FRB's that date back to 2001. You can check out the logs of past and current FRB's at this link for FRBCAT. Now that we know what we're searching the skies for, other radio telescopes have also picked up FRB's. However, the Lorimer Bursts are the only ones scientists believe to be genuine. The repetition of these mysterious FRB's have made it easy for them to research. Although they don't know what's causing them, they do have some theories. The rapid spinning of pulsars, which spew magnetic jets of radiation from their poles, are one known cause of radio signals from deep space. The beam of light emitted by pulsars can only be received when they're facing Earth. This discovery that pulsars are what caused some transient FRB signals, detected in the early 1960's by Jocelyn Bell Burnell, earned her group a Nobel Peace Prize. Her discovery is one reason why I believe the Lorimer Bursts are not intelligent life beaming a signal from some far away galaxy. Following Burnell's discovery, the satellite search for evidence of nuclear testing yielded the discovery of radiation originating from high above Earth. Scientists concluded that the radiation was coming from somewhere else entirely. Since then, by studying the radio signals with their differing wavelengths and afterglows in the spectra, we now know that the causes can be massive neutron star explosions, or even star collisions. The Lorimer Bursts are also the first radio signals to come in at a higher frequency in comparison to the others. FRB's are usually only heard very faintly. Scientists previously ruled out a massive black hole. Dwarf Galaxy's don't tend to have stars that big, they thought. However, since the Lorimer Bursts are short in duration, have a polarity, and are coming from a galaxy with an exceptionally strong magnetic pull, it's most likely a black hole. Astronomers believe the reason the pulse bursts are so powerful and can be seen, is because their source of origin is something 100 million times more powerful than our sun! This would mean it is probably a neutron star. The polarized signals, according to researchers, go through something called Faraday Rotation. The distortion, or "twist," of the signal happens when polarized light travels through plasma (very hot, strongly magnetized gas) and the only other known place that comes even close to having conditions for Faraday Rotation that strong, is near the black hole of our own galaxy! For most of last year, FRB 121102 was documented as being very quiet and then we picked it up again. If some object had gotten between us and the signal, such as a large planet (or even another solar system! After all, it IS 3 billion light years away! ), or whatever it is possibly rotating on it's own axis, I believe that would be the cause of it's signal disruption last year. Bottom line: It is so far away, even if it WAS intelligent life, it's probably not there anymore! Besides the astronomers research evidence, there are some other reasons on why I don't believe it's intelligent alien life, but, I'll get to that in a minute. Our Solar System is still a mysterious place that we are just beginning to explore with space probes. With every step mankind takes toward technological advancement, we are able to go further and see more of just our own planet. We're located within an arm of our Milky Way Galaxy, which looks like someone threw up a handful of sparkling white stardust, that shaped itself into a wheel, against black velvet we call "the universe." On the clearest of nights, we can actually observe parts of the Milky Way with the naked eye. Just click on the link under the above picture to see photographs taken of our galaxy by stargazers around the world! They even share what cameras they used! What lay around us and how it all got here, are still the gazillion dollar questions we can't help but try to calculate the answers for. The origin of life has been mysterious to mankind since we first gazed at the twinkling night sky. Today, even though the center of our galaxy is 25,000 light years away, we now have the ability to observe the black hole in the center. All thanks to the brilliant minds who created MeerKAT and you can read about it here! I don't think we should wonder if intelligent life exists. We know it does. It's right here on our own planet! I definitely believe there are aliens. Probably right at the bottom of our oceans, where it's easy to hide. Those 'Watchers' are probably making sure we don't nuke ourselves! But, just like there are good and bad people in the human race, I also believe there are good and bad in aliens. If some of them can really be called that. How do we know they weren't here before us? We have a lot of stories like this one about the Ant People and there are strange UFO sightings all the time! Some UFO's have been spotted coming out of water near Japan! We have already started on planning to get Human civilization, living and prospering, over to Mars. NASA is planning another trip to the Moon. How do we know that it wasn't already done here on Earth? From another solar system, or even another galaxy? Even Stephen Hawking said that we are only a danger to ourselves! Any intelligent life from another planet that came here, is probably much more intelligent. He said, and I quote, in regards to making contact with other intelligent life forms, "Meeting an advanced civilization could be like the Native Americans encountering Columbus." I think they are here, have been for a very long time, and maybe they are too smart to make us scared Humans panic! I've never seen an Alien or UFO (at least I don't think so!) but if I did, I probably wouldn't know it. Would you? *Did you like what you read? If you did, why not leave a tip? If not, you can check out my profile to see what else you like!